Being asked to produce and execute the dream wedding for Renata and Nick was an honour and a privilege. It was also a challenge as Renata is a prominent Melbournian wedding stylist and the director of Weddings Of Distinction. 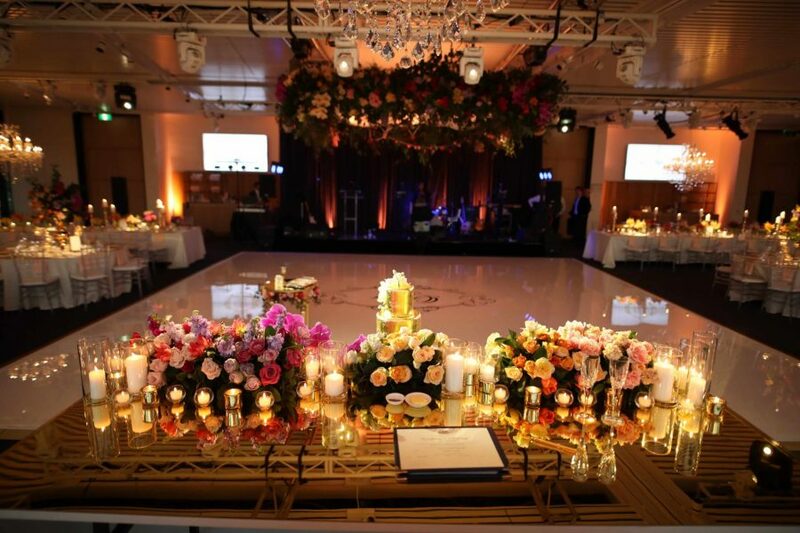 This meant that all eyes (and judgments) were following this event to see how these wedding experts were going to execute their own “once in a lifetime” event. Our first challenge was the venue. 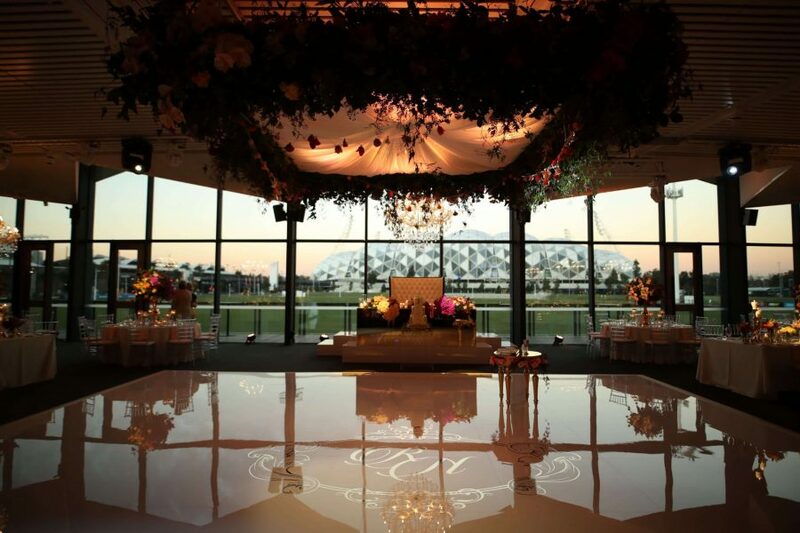 The Glasshouse is a beautiful venue overlooking the famous AAMI stadium, however, the design was more suited for corporate events and as a conference venue. 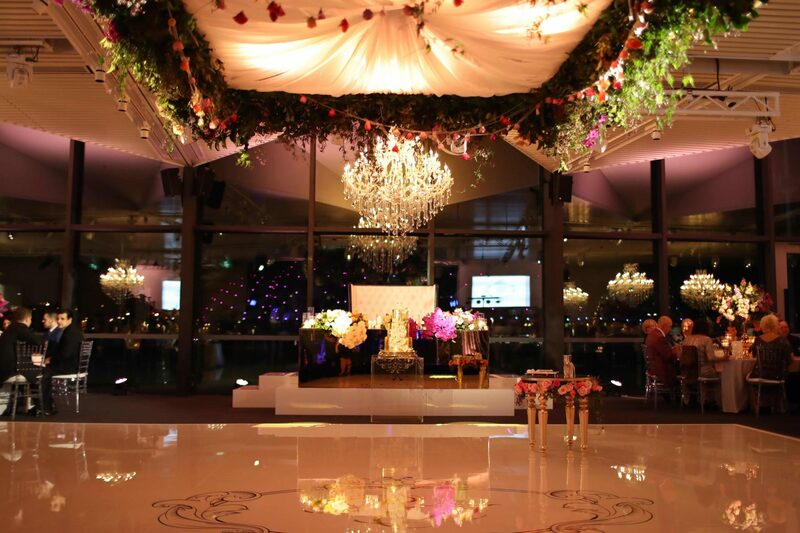 Next, we had to find a creative solution to support both the ceremony and the reception being held in the same space. Coupled with a wedding that transcended 2 cultures; Jewish and Greek. Working with Renata as the wedding stylists expert, we created a jaw-dropping solution that evoked “oohs and aahs” from the guests. 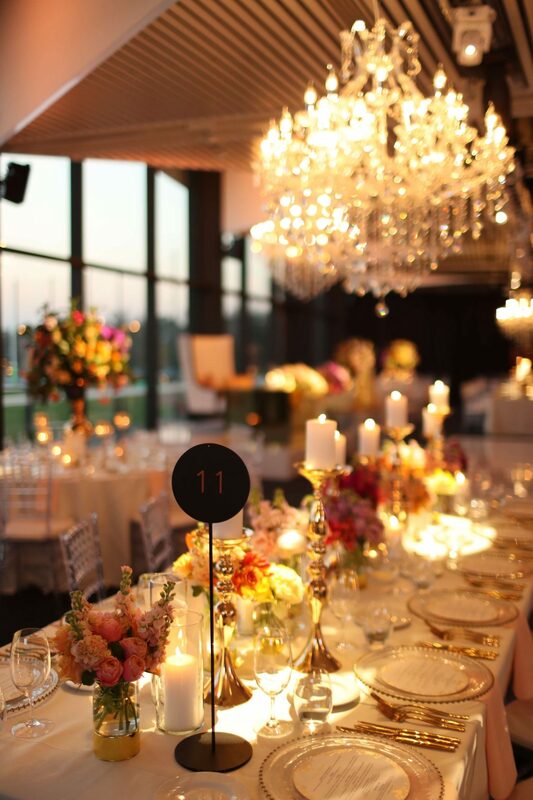 Using a white gloss dancefloor with a gold monogram, crystal chandeliers, white gloss bridal stage with gold bridal table housing just the bride and groom and coupled with a bright colourful flower pallet we dressed the room to impress. Custom ordered charcoal draping separated the room. 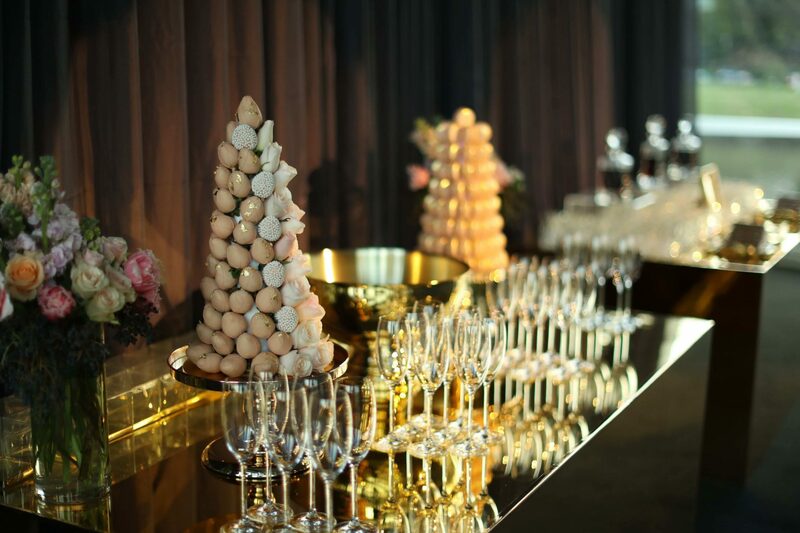 A surprise lounge area with a gold cigar – whiskey stand for the men and a macaroon – champagne station for ladies created the perfect setting for a reception area. However, all of this paled in comparison to the Chuppah installation. Our team devised a ceiling installation that descended at the touch of a button. Upon descent, ribbons fell from the corners, decorated with flowers to create the Chuppah “legs”. As the Chuppah dropped, the guests gasped. The theatrics were mesmerising. 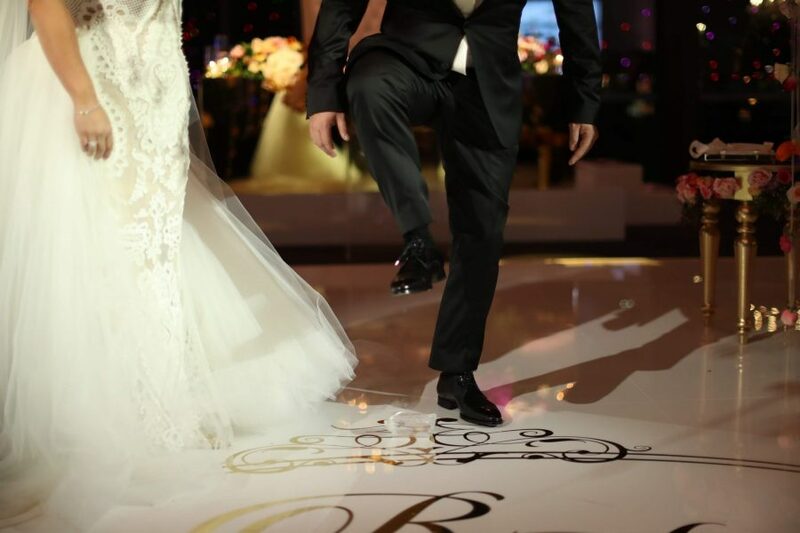 A “once in a lifetime” cross-culture wedding. Incorporating the timeless Jewish traditions of the Chuppah and the breaking of the glass and the Greek Stefana (marriage crowns). A bride and groom feeling over the moon with joy, excitement, and gratitude. Guests, transfixed by the theatrics, beauty, and design of the event. And finally, a venue come to life with colour and emotion, paving the way for future “once in a lifetime” events.